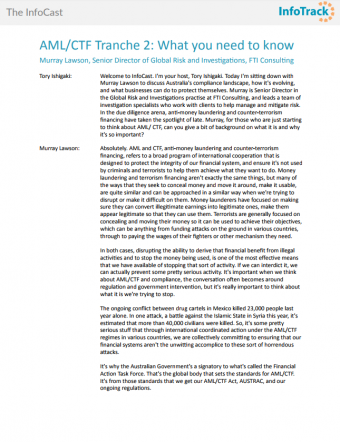 Murray Lawson, Senior Director of Global Risk and Investigations at FTI Consulting, discusses the upcoming implementation of Tranche 2 of Australia’s AML/CTF Act and how it will impact lawyers, conveyancers, real estate agents and accountants. Learn how your business can start putting processes in place to build a culture of compliance and ensure due diligence. "I strongly suspect Tranche 2 will come into effect in 2018; the legislation seems on track. There will be challenges, but compliance shouldn’t be viewed as a cost on the business, rather it should be a way of managing the risks that good opportunities present you. Get educated about what the requirements are going to mean for your business, and have conversations about what information you’re already collecting and what changes will need to be made"
Need help with due diligence? Find out how InfoTrack can help you implement better compliance procedures.